Japan has its own mythical elixirs of immortality – rice mochi (the myth as the moon rabbit pounding rice mochi), soma and sake alcohol, homa, hemp, peach and peachwood*; pearl (ground or whole); ningyo mermaid fleshmeat; homa; iris and deer horns, golden cinnabar and zhu (hakuchi), the last, hakuchi also read as okera was a perennial belong to the chrysanthemum family. The search for the Elixir of Life has been the supreme quest for many. In medieval times, there are accounts of the alchemists looking for the philosopher’s stone, believed to be required to create the elixir but also to convert lead to gold. Bernard Trevisan, an alchemist of the 15th century said that dropping the philosopher’s stone into mercurial water would create the elixir, and we have multiple cases of alchemists that allegedly found the Elixir of Life including the infamous Cagliostro or Saint Germain. The poem reads: Inexhaustible is / The water of chrysanthemums / From the heavenly Chrysanthemum River. It praises sake (Japanese rice wine) as a drink of immortality by likening it to the chrysanthemum dews, by drinking which Kikujidô [Chrysanthemum boy], a legendary figure, obtained eternal youth. Shôjô is also a mythical creature that loves sake and is synonymous with a heavy drinker. There is a nô play called Shôjô, in which the creature becomes drunk and begins to dance. 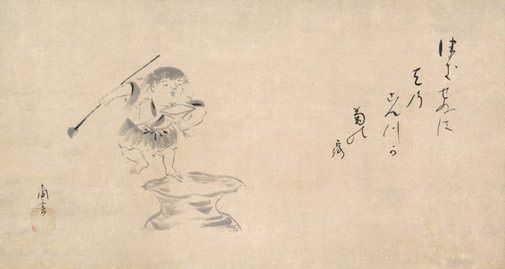 Magu is a goddess in Chinese Taoism god system, and “Magu Presenting a Birthday Gift” is one of the leading subjects in auspicious folk pictures. Magu was originally a native of Jianchang (present-day Nancheng Town in Jiangxi Province). To the southwest of the town, there lay a mountain called Magu, which was called Danxia Mountain a long time ago. It is said that the girl cultivated Tao on this mountain and finally became an immortal. She was able to turn rice grains into pearls by throwing them up in the air, and walk on water in wooden shoes “as easily as Bodhidharma crossing a river on a reed”. She often donated rice to the poor. Whenever people saw her, she always looked like a beautiful girl of 18, always wearing embroidered clothes. When asked how old she was, she replied that she had seen the sea turned into fields three times. So people regarded her as a symbol of longevity. 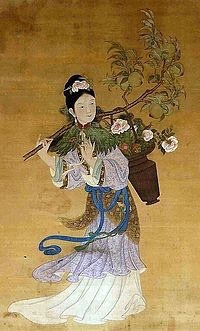 In the old days, when a woman celebrated her birthday, people often gave her a painting of Magu, a symbol of longevity. Legend has it that the third day of the third lunar month was the birthday anniversary of the Queen Mother of the Western Heavens, and all deities would come from all parts of the world to offer their congratulations to her. On those occasions, the Queen Mother of the Western Heavens would hold a grand party and offer peaches of longevity to the guests. At one such party, Magu brought as a gift some wine made of glossy ganoderma growing by the side of the Jiangzhu River. This is the origin of “Magu Presenting a Birthday Gift. Provenance: Private Italian Collection, Rome. 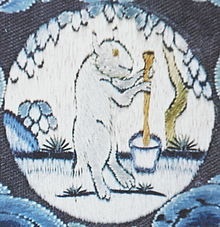 Alternatively, magu or mako is seen bearing a drink beverage of longevity, seen in the above silk commemorative hangings. 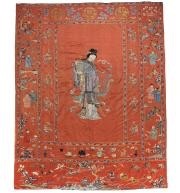 Textile panels, such as the celebratory hangings included in this section, in China were hung in a prominent position. They transformed both domestic and sacred spaces on specific occasions, communicating meanings in many visual forms and thus embodying powerful traditional values held by the Chinese society. The finest commemorative hangings were often commissioned by professional workshops and mainly consisted of figurative images recurring in 18th and 19th century decorative arts. Red ground celebratory textiles, such as those presented here, contrasted with the white ground or “mourning” textiles. The hangings were made in different shapes and sizes and meant to be displayed to commemorate festive occasions such as birthdays and weddings. Some of the panels bore inscriptions relating to the personal qualities of the people involved in a particular anniversary. The theme of the twenty-four filial paragons, a canon of stories which appeared to be codified during the period of the Han dynasty, for example, often seemed adequate to pay homage to an elderly parent or relative. Other popular subjects were the Shou character for immortality and the Eight Immortals, semi-legendary figures originally associated with Daoism and beliefs in immortality. Standard features were employed to portray the characters of these popular stories so they could be instantly recognisable by the viewers. Other popular stories include the Birthday Celebration of General Guo Ziyi of the Tang dynasty, at his estate in Fenyang. Drawn from the legend A Tableful of Honors, Guo Ziyi had many sons and grandsons and the numerous figures dressed in official attire around the general indicated that the family was successful in attaining a high office. By extension therefore, employing the image of general Guo and his family on a panel as a congratulatory gift, was thought to bring good fortune to its recipient. Other popular themes included… the goddess Magu, originating from folk love songs and festivals. Symbolic protector of females, symbol of long life and fertility, Magu prepared a longevity, alcoholic beverage to present as a gift at the birthday banquet of the Queen Mother of the Western Paradise. Exhibiting images that were thought of acting just like their real counterpart and thus provoking benign effects on behalf of the owner, commemorative hangings are a precious testament to the ideological values of Imperial China.